Yastrebets Wellness & Spa is a hotel located in Rila Mountain, just above Borovets, on one of the best ski runs in Bulgaria – Yastrebets. 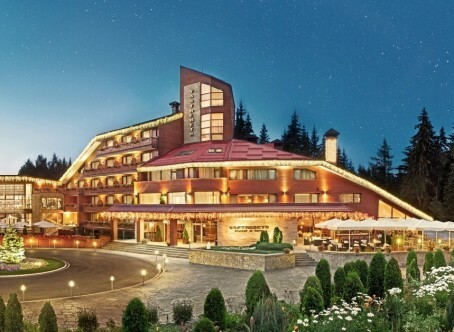 The hotel offers year-round programs for relaxation and recreation or sports activities in the unique Rila park. During the winter season, ski- and other winter sports fans can indulge in their hobby on the slopes in one of the biggest Bulgarian ski resorts – Borovets, while in the rest of the year the high pines, the clean air and the nature provides opportunities for long walks and great summer breaks. Sweet deserts prepared every afternoon at the fireplace in the lobby bar. The offer is valid for the period 21.12.2018 – 26.12.2018. The minimum stay is 3 nights. The quoted rates for all rooms are per night, in euro. Sweets prepared every afternoon in front of the fireplace in the lobby bar. The offer is valid for the period 21.12.2018 – 05.01.2019. The minimum stay is 4 nights. The package price includes snacks and dinners and a New Year’s Eve dinner with drinks.